The number of portable gadgets that we use has grown substantially in the last few decades. Many of these, such as TV remote controls, some digital cameras, handheld GPS units, and flashlights, are designed to operate on either disposable alkaline batteries or rechargeable, and hence reusable, Nickel-Metal-Hydride (NiMH) batteries. At the same time as our battery-powered device use has increased, rechargeable battery technology has improved dramatically. Unfortunately, information on the proper care and use of these batteries can be hard to find. This article attempts to provide this information and answer the questions I am often asked. The earliest consumer rechargeable batteries were Nickel-Cadmium (NiCd), based on technology perfected in the 1950s. These typically had only about 10% to 20% of the capacity of disposable alkalines of the same size. Devices using these batteries would run for only 1/10th to 1/5th as long as they would on alkalines. Fortunately, when the batteries did run down, they could be recharged. Properly cared for, even these early rechargeable batteries would last for several hundred recharges. A serious concern with NiCd batteries is that cadmium is a very toxic metal, making battery disposal problematic. Many NiCd batteries have made their way to landfills, contaminating our environment. Now, recycling of NiCd batteries is mandated by law in most western countries. The mid 1990s saw the introduction of Nickel-Metal-Hydride (NiMH) batteries. These had very similar properties to NiCd, but with higher capacity, and more importantly, no super-toxic components. The only drawback of NiMH compared to NiCd (at that time) was a lower maximum current. High-current applications like cordless power tools and electric powered model aircraft and cars continued to use NiCd batteries for some time. As of 2008, some power tools still use NiCd batteries, although model aircraft have switched almost entirely to NiMH and Lithium-Polymer batteries. There are four important characteristics of any battery: voltage, maximum current, capacity, and self-discharge rate. Comparison of the discharge voltage of an alkaline battery (red) and a NiMH battery (blue). The green line is the voltage at which the battery is considered dead. Voltage is measured in Volts (V). Single-cell disposable alkaline batteries such as the common AAA, AA, C, and D sizes have a nominal voltage of 1.5V. 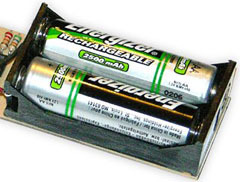 The same sizes of NiCd and NiMH batteries provide only 1.2V. This lower voltage might seem to be a problem, but in most cases it isn’t. Although a fresh disposable battery provides about 1.5V, the voltage gradually drops as the battery is used up. Most electronic devices will continue to work even when the battery reaches 1.1V. A NiMH battery starts out at about 1.2V (it actually starts at about 1.4V, but drops to 1.2V almost immediately), but as it discharges, the voltage remains relatively constant, dropping only to about 1.1V just before the battery is fully depleted. Despite starting at a lower voltage, the NiMH battery still provides a usable voltage during its entire discharge. Voltage is not the only important attribute of a battery. A battery produces a voltage, but the equipment it is powering requires that voltage to be delivered at some current, measured in Amperes (A). If you think of voltage as water pressure, then current is the rate of flow. All the pressure in the world won’t do you any good if the tap is closed. Batteries have a limit as to how much current they can produce, much like your tap can’t provide as much water as the fire hydrant on the corner, even though the pressure might be the same. In this area, NiMH batteries have a big advantage over alkalines, being able to deliver significantly more current. This makes them well suited to high-current devices like digital cameras. As mentioned above, early NiMH batteries could not supply as much current as NiCd batteries, but this is no longer the case, with NiMH having surpassed NiCd in this area. If voltage is water pressure and current is flow rate, capacity is the total amount of water available. A higher capacity battery holds more than a lower capacity battery. At a given current (flow rate), the higher capacity battery will provide its voltage (pressure) for a longer time. Typical early AA sized NiCd batteries had a capacity of about 0.25 Ampere-hours (Ah). This meant that it could provide 0.25A of current for one hour. It also meant that it could provide 0.125A for two hours, 0.5A for half an hour, or any combination of Amperes and hours that multiplied out to 0.25. As of 2008, a good AA NiMH battery has a capacity of about 2.5Ah. In theory, it can deliver 2.5A for one hour, although 2.5A is more than some batteries’ maximum current. However, such a battery could, for example, deliver 0.5A for 5 hours (since 0.5 × 5 = 2.5). This capacity is about the same as that of a good modern disposable alkaline battery, although the alkaline battery will usually have a much lower maximum current than the NiMH battery. Note that most batteries have their capacities advertised in milliAmpere-hours (mAh). One Ah is equal to 1000mAh. So for example, a 2500mAh battery is the same as a 2.5Ah battery. Four low-self-discharge Sanyo Eneloop AA batteries in their reusable storage pack. Compared to disposable alkaline batteries, tradtional NiMH batteries have one serious disadvantage: self-discharge. A quality alkaline battery will have a shelf life of about three to five years. You can leave it in a drawer until you need it, open the package, and expect it to still have virtually all the capacity it ever had. Until recently, most NiMH batteries had a very high self-discharge rate. They would lose capacity even when not in use. A good NiMH battery had a self discharge rate of about 1% per day. After each day of sitting idle, it would have only 99% of the capacity that it had the day before. After about a week, it would be at 93%; after a month, 73%; after three months, 40%. Recent improvements in NiMH technology have produced low-self-discharge batteries which can retain up to 85% of their charge after sitting idle for a whole year. For a comparison of low self-discharge batteries, please see my article, Pre-Charged (Low Self-Discharge) Rechargeable Battery Roundup. There are several factors to consider when choosing a NiMH battery. From most important to least, these are: size, desired usage, capacity, and brand/price. Size – AAA, AA, C, or D? Obviously you need to buy the right size battery for the device you plan to use them in. Fortunately, NiMH batteries come in the same sizes as disposable batteries, so just buy the same size of NiMH. By far the most common size is AA. AAA is also common, and C and D sizes are available in some brands. In order to reduce manufacturing costs, some manufacturers’ D sized batteries have the same capacity as their C size, since they simply enclose the innards of a C battery in a D size shell. Other manufacturers have gone even further, producing only AAA and AA sizes and selling separate C-sized and D-sized shells into which you can insert an AA battery. If you will be using your batteries immediately in a high-drain device such as a digital camera in a day-long photo session, freshly charged conventional NiMH batteries are suitable. If on the other hand you will put them in a device with very low drain and/or one that is expected to run for a long time such as a TV remote or a wall clock, low-self-discharge batteries are a better choice. In fact, even a high-drain device that is used intermittently, such as a point-and-shoot digital camera that you keep in your pocket or purse, is better off with low-self-discharge NiMH technology. I’ve personally stopped buying traditional NiMH entirely, using low-self-discharge batteries everywhere. The disadvantage of their slightly lower freshly-charged capacity disappears after a week or two of sitting idle. It’s good to know that my digital camera will be able to take 200 pictures today, or next month. If I used higher capacity traditional NiMH batteries, it might be able to take 250 pictures today, but only a handful if I let it sit for a few weeks. The capacity of rechargeable batteries has increased steadily over the years, although it appears to have levelled off at around 2700mAh for the highest capacity AAs. Low-self-discharge AA batteries have about 2000mAh capacity although this may improve in the future. Often, batteries sold as part of a bundle with a charger will have lower capacity than the state-of-the-art. These lower capacity batteries are effectively obsolete, meaning that the charger manufacturer probably paid next to nothing for them, and can afford to use them to entice you to buy their charger. A pair of Eveready Energizer 2500mAh (2.5Ah) AA rechargeable batteries. One thing I’ve found with NiMH batteries is that you generally get what you pay for. Buy cheap batteries and you’ll likely be disappointed. A cheap battery may have the same advertised capacity as a better brand and it may even have the same actual capacity at first. However, I’ve found that the cheaper batteries quickly deteriorate, and after a few recharges, will no longer hold as much charge as when they were new. Which is the best brand? My personal favourite is Sanyo. Before the switch from NiMH to Lithium-Polymer in the electric model airplane hobby, Sanyo was king. Their batteries took the abuse that we dished out (charging in under 20 minutes and then running at such high currents that we depleted them in 5 or 6 minutes) and kept on working for years. My experience with Sanyo’s consumer AA batteries has been the same; they hold up after years of use and hundreds of recharges. Another good brand (common in Europe) is Varta. I have an eleven year old Varta battery pack that, when freshly charged, still has 80% of the capacity that it did when it was new. Brands to stay away from are those you’ve never heard of. I personally also have not had much luck with rechargeables from the two big brands of disposable batteries. Think about it: if your primary source of income was the repeated sale of high quality disposable batteries, would you jeopardize that business by selling a rechargeable battery that only needs to be replaced every five or ten years? The best rechargeable NiMH battery you can buy will not last long if you don’t take good care of it. This primarily means charging it correctly. There are two main classes of chargers, “dumb” and “smart”. A “dumb” charger charges the battery very slowly, typically taking 14 to 16 hours to fully charge a dead battery. When the battery is full, the charger keeps charging it anyway. The excess charge is turned into a small amount of heat, which won’t harm the battery as long as it doesn’t go on for too long. The process is somewhat like filling a bathtub with a very slow stream of water, counting on the excess water to evaporate faster than it accumulates on the floor after the tub overflows. Dumb chargers were the norm in the NiCd days, and many a NiCd battery was ruined by leaving it connected to the charger all the time. A prime example of this is the popular rechargeable handheld vacuum cleaner, most of which don’t last more than a year or so before the battery refuses to remain charged. NiMH batteries are more prone than NiCd to damage caused by being left connected to a dumb charger, so such chargers are starting to disappear from common use. If you do use a dumb charger you should remove the batteries from the charger when the charging is complete. The problem is knowing when this has happened. Most dumb chargers are designed to charge at a rate that takes 14 to 16 hours for a full charge. However, this is only the case if the batteries were fully depleted before beginning the charge. Partially depleted batteries will reach full charge sooner. Furthermore, if you use the charger with batteries of a higher capacity than it was designed for, a full charge will take longer than 14 to 16 hours. In short, properly charging with a dumb charger is a guessing game. The reason dumb chargers were so popular is that they are inexpensive to make. It needs no brains to determine when to stop. Although overuse of such a charger damages the battery, this damage appears as a gradual reduction in capacity rather than a catastrophic failure. With NiMH batteries’ lower tolerance to continued overcharging, so-called “smart” chargers have become more common. In addition to not overcharging, these chargers charge much faster, typically in one to five hours depending on the charger. The reason there are no dumb fast chargers is that overcharging at these higher rates can result in a battery overheating, popping its seals, and possibly starting a fire. A good fast charger uses one of two methods to determine that the charge is complete: −ΔV or ΔT (negative delta-voltage, or delta-temperature). The first of these detects the voltage drop that a NiMH battery exhibits if you attempt to keep charging it when it won’t take any more. The second method detects the temperature increase once the excess charging current starts getting turned into heat. Some chargers use both methods, with −ΔV as the primary method and ΔT as a safety backup. A good fast charger is much better for the battery than blindly slow charging it. However, a bad fast charger (one that doesn’t turn off very soon after charging is completed) can damage batteries too. If you travel a lot, there are now several USB-powered AA NiMH smart chargers on the market, including one by Sanyo (reviewed here), and one by Eveready. I’ve also published a do-it-yourself USB-powered charger design. Note: Be careful when purchasing a USB-powered NiMH charger. The term “USB Battery Charger” has taken on two separate meanings: a USB-powered NiMH charger like we are discussing here, or a device meant for powering other USB-powered devices (like MP3 players). Vendors, even in traditional stores, often don’t know the difference. Charging rechargeable batteries in well under an hour is not new. We’ve been doing this for years in the electric model airplane and car hobby, primarily with NiCd batteries. Recently, several 15 minute chargers have appeared for AA consumer NiMH batteries. At first glance this might seem like a great idea, but it isn’t. Due to the internal resistance of any battery, the charging process produces heat. The amount of heat produced is proportional to the square of the charging rate. In other words, if you charge four times as fast (for example, 15 minutes instead of 1 hour), you will produce sixteen times as much heat! Because of the high currents used in electric powered models (typically anywhere from 10 to 40A), we used NiCd batteries with extremely low internal resistance (the same ones used in power tools). This translates to proportionally lower heat production during charging. The chemical reaction involved in NiCd charging is endothermic, meaning that it causes the batteries to cool. Up to a point, this cooling is more than enough to absorb the heat produced by the internal resistance. The NiMH charging reaction doesn’t have this handy property. A good quality consumer AA NiMH battery has a much higher internal resistance than the larger Sub-C sized batteries used in electric models. At the same time, it has less surface area with which to dissipate heat. Charging it at the very high currents required for a 15 minute charge will produce immense amounts of heat, which, after a very small number of recharges, this will cause the battery to deteriorate. 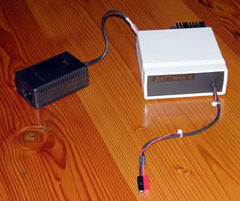 Instead of a trickle charger, a regular overnight charger connected to a timer can keep a NiMH battery charged. The main advantage of super-fast charging is that you can quickly have a set of batteries ready for use. With the introduction of low-self-discharge batteries, this isn’t really necessary any more since you can store the batteries in their fully charged state, ready to go. Other than using low-self-discharge batteries, one way to ensure you always have a set of NiMH batteries ready for use is to attach them to an appropriate trickle charger. A trickle charger is similar to a slow dumb charger, except that it’s even slower. Typically, the charge rate is only slightly more than the self-discharge rate of the battery. The trickle charger produces only enough current to keep the battery from self-discharging. Think of filling a bathtub with an eyedropper, just fast enough to make up for the water that’s evaporating. Some battery experts feel that trickle charging is detrimental to the long term health of the battery, much like continuous overcharging on a dumb charger is. 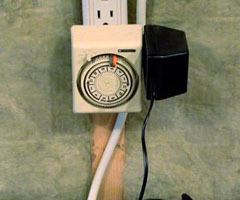 An alternative approach is to use a dumb charger connected to a timer set to provide power to the charger for only half an hour per day. I’ve personally used this technique with the 1.6Ah NiMH batteries in my radio-control transmitter and so far the battery is still going strong after about five years of this treatment. Once these batteries start to deteriorate, I will replace them with low-self-discharge ones and just recharge them after I’ve used them. BattMan II, a do-it-yourself computer controlled battery manager for NiMH (and other) batteries. Measure their capacity by discharging them at a known current while keeping track of the time this takes. Rejuvenate batteries that have suffered from voltage depression. Detect batteries that are having trouble accepting a charge. Measure internal resistance to help detect batteries that are going bad. There are several commercially available battery managers such as the La Crosse Technology BC-900. If you are electronically inclined, you can also build your own. Traditional NiMH batteries, if stored for a long period of time, should be stored in a cool dry place. They should also be recharged every few months. Turning them over periodically also seems to help, since the electrolyte tends to pool in one side of the battery. 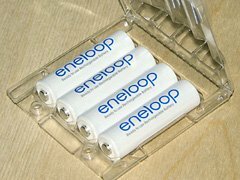 The newer low-self-discharge batteries like Sanyo’s Eneloop are designed to hold their charge in storage. Sanyo recommends storing them at low temperatures, so the fridge might be a good place. It’s probably also worthwhile to recharge them once a year or so. I keep my spare Eneloops in a drawer in the house, and try to use the least recently recharged ones first. When one becomes depleted, I grab the next one in line. I recharge the depleted one and put it at the end of the queue. As NiCd and NiMH batteries age, users often observe that they last less and less long between recharges. This is usually attributed to a phenomenon called “memory effect”, caused by repeatedly using only part of the battery’s capacity before recharging it. The battery appears as if it “remembers” that only part of its capacity was used before it was recharged, and thus refuses to deliver more than that. True memory effect only occurs in cases where the charge and discharge cycles are exactly the same every time. One of the few places where this occurs is in Earth-oribiting satellites which charge their batteries using solar power for some period of time, and then operate from their batteries while the satellite is passing around the night side of the Earth. These cycles are exactly the same length every time. After a while, NiCd batteries will suffer from memory effect. It is extremely unlikely that this effect is ever seen in consumer batteries. Discharge of a healthy NiMH battery (blue) and one suffering from voltage depression (red). Notice that the lower curve crosses the cut-off level (green) sooner, resulting in an apparent reduction in capacity. There is another phenomenon known as voltage depression, which is caused by excessive over charging on a dumb overnight charger, and possibly by excessive trickle charging. This phenomenon manifests itself as a lower than normal voltage without a reduction in capacity. The reason this looks like memory effect is that the lower voltage makes the equipment in which the battery is being used “think” that the battery is almost depleted before it actually is. NiMH batteries are often advertised as being immune from memory effect. This is probably true, but misleading because they are still prone to voltage depression. In fact, they are more easily damaged by overcharging than are NiCd batteries. The solution to this problem is to not overcharge the batteries. If using a dumb charger, remove the batteries from the charger after 14 to 16 hours, or sooner if they weren’t fully discharged yet. Better yet, use a smart charger that stops automatically when charging is complete. Fortunately, voltage depression can be cured. Fully discharging and then recharging a battery two or three times usually brings the voltage back to where it should be. A battery manager is ideal for this. Terrific article, thanks! I just bought an expensive headlight for my bike, a Dinotte that uses rechargeable AA NiMH batteries. Wanted to know how to handle recharging the batteries to be sure I’ve always got a fully-charged set on hand. I won’t use the headlight more than two or three times a month, but when I need it, I’ll really need it. Boats, alkalines just can’t deliver the current required by digital cameras without the voltage dropping too low. Hence they are quickly "dead" (although they will probably still work in a clock or flashlight). The NiMH batteries you bought will probably be much better. Just how much depends on their quality, and how well their voltage holds up under load. If they don’t last very long (at least 100 photos), you may need better NiMHs. Here, in Melbourne, Australia, low self discharge NiMh batteries are becomming widely available and I have recently purchased a set of Varta AA ‘Ready2Use’ batteries. So far, I have been rather dissappointed by their lower capacity (2100 mAH) = shorter life in my Canon point and shoot digicam. These seem to bring up the low batt symbol quicker than my previous set of normal Sony NiMH’s. Ofcourse, I haven’t done any comprehensive testing like what Stefan does, but I’m taking his suggestion onboard to move to these new long shelf life batteries on all new purchases. Well written, great article. Wish the whole web was like this. I am wondering which is best AA battery: 3100 mah conventional NiMH, or low self-discharge 2100 mah NiMH. I’ll be using them in a radio that consumes 7 to 10 mA in normal operation, and I listen to it for about 1 hour per day. The 2100mA low self-discharge would definitely be the better choice in this case. If the radio is only consuming around 10 mA, then a 3100 mAh NiMH battery would theoretically power it for 310 days of one hour per day. In practice, it will power it for about two weeks to a month because of the battery’s self-discharge. The 2100 mAh low self-discharge battery on the other hand would only be good for 210 days in theory. In practice, you’d probably get around six months out of it (because low self-discharge doesn’t mean _no_ self discharge). I’ve had personal experience with two different 15 minute chargers (the Energizer and the Dynex (Best Buy house brand, now (sadly!) discontinued)) with regular Energizer 2500 mah AA and 750 mah AAA cells and Eneloop AA and Duracell (can’t get Eneloop AAA’s locally) AAA cells. With the regular cells, the Energizer charger would usually get them extremely hot (wouldn"t actually burn you, but you want to drop them pretty quickly) and the Dynex would usually just get them uncomfortably hot. (sorry, no actual temperature measurements). With the long-charge-retention cells, the Energizer charger gets them just comfortably warm, and the Dynex charger gets them just barely perceptibly warm. I also used to fly RC planes (gliders, in Ventura mainly, when I lived in Ojai), and used some of the chargers made for RC enthusiasts. Now I am buying some AA/AAA chargers, and am still a bit confused on a couple of issues. There is a one-hour charger made by Lenmar (sold at Amazon.com) that claims to use a different technology ("Neotherm") to keep the batteries cool while charging. I can’t help wondering if some clever Chinese electrical engineer couldn’t put together a fairly inexpensive charger that employed some non-patented variation on one of the patented pulse or reflex charging technolgies? Anyway, I’m hoping that this charger isn’t just marketing hype, and that the fan will at least do the job. I want fast charging, without special (IC3) batteries, and without hurting battery longevity. Do the LSD batteries last longer (or stay cooler) when charged in most of the one-hour chargers? Also, slow chargers are often claimed to be more gentle. It seems obvious that some of the 15-minute chargers are damaging the batteries, or significantly shortening their useful lifespans. What about the one-hour chargers? How significantly ‘less gentle’ are they? Do you lose roughly 50% of lifespan, or just 10% or so? Less? More? It probably depends largely on the charger; yet I’m sure this issue has been covered somewhere in the engineering community, and that there are graphs and formulas that give a good sense of how much damage is occuring under what conditions. If a fifteen-hour charger is gentle and good and the best for the batteries, when you can afford the charging times, then what does that say about four-hour chargers?, two-hour chargers?, one-hour chargers? Are some of them gentle enough?, much gentler than others? Some of the Maha (or Powerex) chargers (the eight-batteries-at-once ones on Amazon) appear to use pulse charging, and apparently keep the batteries cooler than the LaCrosse BC-900. This seems good — faster charging without damage (if faster charging is important for one’s uses). I wonder how much better (in the sense of non-damaging one- or two-hour charging) these chargers are than most of the other (on- or two-hour) chargers that do not use the pulse charging? Very informative article Stefan, much thanks. Now I realize what kind of AA NiMH batteries I need for my RC transmitter: low self-discharge batteries with at least 2000mah capacity. When I started to look for batteries and chargers I noticed that the charge duration and current were almost proportional; say, 12-14 hrs, versus 1-2 hours, the current was about 8-10 fold in difference. Before reading this article I figured it would be unwise to use a 1-3 hour charger for nimh batteries. It seems they are not so harmful as long as they have a good cutoff method. 15 minute chargers, heh, I’ve seem them turn batteries into firecrackers. Eventually, I’ll have to go from AM to FM with the radios for my RC truck. As long as the controller uses either a nimh pack made for it or eight AA nimah batteries, I’ll be happy. Stefan, you have hit the target plumb center. I have seen endless discussion of the "memory effect" problem in NiCd and even NiMH batteries, in various forums. Battery and charger suppliers advise routinely discharging NiCd batteries before every recharge, and occasional discharging of NiMH batteries before recharging, to reverse/prevent the memory effect. It does happen that these procedures have some benefit for dumb chargers (devices, not users), as discussed below. Considering that NASA found that the true memory effect could be reversed by overcharging the batteries, it is a chuckle that the supposed cure for it in consumer use would be to fully discharge them before recharging. This wouldn’t do much if anything to help, if the problem were true memory effect instead of the actually prevalent voltage depression effect. Re voltage depression, this was mainly caused by using dumb chargers to charge partially depleted batteries, for which no rational way to determine end of charge existed. The only recourse was to leave them charging at least as long as it would take if they were fully depleted, or to manually discharge them first so the charge time was reasonably determinant. The first method resulted in chronically overcharged batteries, thus voltage depression, for which the cure was as advised for the phantom “memory effect”, to fully discharge and recharge a few times. It is tragicomic that those having the very latest high tech smart chargers (LaCrosse BC-900, e.g.) are still doing discharge/recharge cycles on a routine basis whether it is needed or not for fear of the dreaded “memory effect”. BTW, there are some chargers such as the Maha C401FS which use pulse or reflex/burp charging to prevent or reverse memory effect. Given the lack of any such problem, what if anything is the benefit of such a charge cycle? I believe the duty cycle consists of a square current pulse of slightly less than 1 second duration, a brief zero current rest period, then a very brief 3X negative current pulse, a second brief rest during which the battery voltage is sampled, and repeat. I believe all smart chargers use a type of pulse charge to provide periodic zero current rest periods to allow sampling of the battery voltage for determination of the end of charge signal, but this is not the same thing. Stefan, We are currently using 2 AA Imedion 2100maH batteries in our handheld Leak Detector. We are having some issues with these, they are fully charged in the unit, but we have been noticing that on some of these, after minimal use aren’t recovering. We stick them back on the charger and for some reason they either don’t charge, or go into the trickle charge state and are unable to go into the fast (steady) charge state. This is a problem for us, as our customers won’t be able to replace the batteries themselves due to our package. They will have to ship them back to us for replacement. Do you have any suggestions? We did notice that one of the batteries usually seems to have more of a charge than the other. Stefan: thanks for your informative article on your site. I am presently having trouble with phone batterys how to tell if OK. I am consering buying a battery charger & NMH batterys for a camera and saw some at Extra Foods (Loblaws)in B.C.which seem to be exact copies of Sanyo, chargers made in China but batterys low discharge from Japan. Do you have any info on these Marked P.C. (Presidents Choice). I would like to donate 1 or 2 slide rules to your collection if I can find them after my recent move if shipping costs are not too high Thanks Harold A. How is Uniross NiMH battery? Is it a good brand? A very well written article. The information is appreciated. I have a question: I’d like to use "standard" NI-MH batteries (AAA), and solder them into a battery-pack of a baby-phone. Can this be done, or will the heat from the soldering gun ruin them. Is there a risk for explosion? Of course, I will keep the heating time as short as possible, but a minimum is required to make the tin fixing the copper cable to the contacts. Has anyone some experience with this? Frans, you can solder to most NiMH cells, but it requires great care. First, the terminals have to be completely clean. I use super fine sandpaper to do this, but be careful not to get any of the fine metal dust into the spacer between the positive terminal and the "can". Wipe off the terminals with alcohol after that. Next, using at least a 60W soldering iron (do not a soldering gun) with a heavy tip, generously tin the ends of the cells. With a good soldering iron, this will take less than one second each. Then prepare your wires, tinning the ends of each. Finally, to attach the wire to the cell, hold it in place and push it down with the hot iron. This will re-melt the solder on both the wire and the cell. Again, this will take less than one second per connection. The problem with soldering guns is that they don’t have enough thermal mass. It doesn’t matter how many Watts the gun is (I have a 140W gun). The tip gets nice and hot, but as soon as you touch it to the cell, all the heat is sucked out and the gun has to generate more. This means it takes much longer to heat up the terminal. On the other hand, I have a 100W iron with a chisel tip and a 20mm diameter shaft above the tip that can solder even to the negative terminal of a C-size NiMH cell in under one second (the iron has so much thermal mass, that it takes 15 minutes to heat up, and I can do regular soldering with it for several minutes after unplugging it). I think explosion is unlikely, because the cells are designed to vent if the internal pressure is too high. If that happens, the cell is ruined. But even before that happens, excessive heat for too long can weaken the seal, or the internal connections in the cell. I have a new FRS/GMRS radio that uses a NiMH battery pack. I was going to put the dumb charger that came with the radios on a digital timer so that it would turn on the charger for 4 hours per week. I noticed in your article that you were doing something similar, but charged for 30 minutes per day. Is there a benefit to using one approach over the other? I use these radios for search and rescue work, so they sit and do not get used hardly ever and then I need to grab them and go and know that the charge is pretty close to full. I could use disposable batteries if required, but I am trying to avoid that. I also just got my first Enloop batteries and I am starting to play with those. The advantage of 30 minutes per day vs. 4 hours per week is that it will keep up better with the self-discharge. If the radios have been sitting almost week with typical NiMH batteries, they will be quite run down. On the other hand, if you use Eneloops or similar low-self-discharge batteries, you can get away with much less charging, say 4 hours once a month. Stefan, a very helpful article and hopefully the start of a more scientific diagnosis of my problem with cordless DECT phones (and for many others as well. I have 3 portable DECT phone handsets each with its own charger cradle, one of which is also the radio base station (fwiw they are BT Synergy 4100 models – http://www.shop.bt.com/productview.aspx?Quicklinx=498S&CategorySelectedId=11206&PageMode=1&NavigationKey=11206,45260000 – I believe the OEM is Siemens). When they were new they worked OK, but as time went on (approaching 1 year) their usability dropped off. The ultimate symptom is that when you make a power demand – receive a call, or lift the phone and press a button to make a call – the phone just dies. It comes back more or less straight away, but will then die again. I don’t know what type of charger they are, but I suspect slow trickle type. On open contacts across a digital meter they deliver about 8v at 0.3A. The batteries I have just taken out report anything from 1.2 to 1.35 V and will only give 1 to 2 A (they are 1000 mAh AAA’s). A new set I have just put in delivered 9A even "uncharged". I have been managing this problem by (i) changing batteries, (which works, for a while) and (ii) thoroughly cleaning the contacts and putting them back on charge (this works for periods of anythign from a few minutes to a few days). Cliff, it sounds like a serious case of overcharging. If the charger is delivering 0.3A, then it’s charging your 1Ah batteries at a 0.3C rate. This is way above the recommended slow-charge rate of 0.1C (0.1A for 1Ah batteries). But even a 0.1C rate is not well tolerated by NiMH. I’m not sure what to advise, because I don’t know if/how the charger regulates the current. I’d start by experimenting with wiring a resistor into the circuit to reduce the charge rate. Try to get the current down to about 50mA. Thanks for the feedback. I’d just about come to the same conclusion, with one interesting extra. The first base station failed and I got a new one. The charge light on that one goes out once charged, whereas on the old one it never did (I thought it was a fault with the new unit). So it looks like they may have found this problem and improved their charging circuit. The other chargers don’t do this, so I’ve put them away and we will only use the ?smart? one on handset at a time, plus new batteries, and see how it goes. Kerry, using a dumb charger and a timer is a technique I’ve used for years for my R/C transmitter battery packs, and doesn’t seem to hurt the packs (at least not noticeably). I suspect that it won’t hurt Eneloops either, but there’s no point doing this with Eneloops. Just charge them up after you use the equipment, and they’ll still be ready to go next time. Top them up once every six months for extra insurance if you haven’t used the equipment for that long. I just pulled a AA charger out of storage that I haven’t used for a few years, with four NiMH batteries inside it. When I plugged the charger in, assuming the batteries would all be discharged, two of the batteries began charging fine, but on the other side of the charger the charging light started blinking, which according to the charger instructions happens when one of the batteries is defective or shorted. On closer inspection, I found some blue residue on the positive terminal of one of these batteries. Did it leak? Is there a way to clean up the battery (and the corresponding terminal on the charger), or should I toss it? Another question–if in general I don’t need a new battery immediately when an old one "dies," is it better to leave the spare batteries discharged until needed, or to charge them when they discharge and then top them off every so often? You have a very educated way of presenting things. They are for techies and laymen alike.Your articles are excellent, very informative and answer most of the FAQs. Thanks for maintaining this site. 1. Should I charge my Eneloop 2000 mAh AA batteries with my Sony BC-CS2B charger. Charger Specs Input: 4-8-8.5 VA, 3W Output : 1.4V, 400 mA ? 2. In the same charger I have 2 slots for AAA with Output : 160 mA, so can I take it that I should be using not more than 800 mAH capacity AAA batteries to be charged by the formula C/5 ? I have solar walkway lights with NiCd batteries. Can I replace the NiCd with NiMH, or are they not interchangeable? Babs, they are more or less interchangeable, but the problem with solar lights is that they charge at a low current until the battery is full but then continue to overcharge the battery. NiCd tolerates this better than NiMH, but the currents are probably low enough that it will be fine. Hi, A good description of NiMH batteries. One thing very nice pointed out was the AA 15 Min battery charger for consumable items. I had a 15 Min battery charger from one the best brands one can buy. They made a mess of the battery. After 15-20 charge cycles the battery refused to accept the charge and had to be discarded. I am myself an electronics engineer I consider buying such a charge a foolish engineering decision!!! Well done! Now I understand how all those rechargable batteries work, and I made up my mind about the next ones to buy!! Thank you very much! Stefan, I am curious about something, after your discussion on chargers: I bought some Sanyo eneloops with their charger (model NC-MQN06U), and it is supposed to take 10 hrs or so to charge the batteries. Is this then a ‘dumb’ charger that may in fact damage the batteries? Would I be better off charging the eneloops with my Energizer charger (CHDC8)? Thanks for the insight you can provide. Hi Ben: The Sanyo NC-MQN06U is a smart charger, albeit a slow one. It charges AA cells at 300mA, so it should charge fully-discharged Eneloops in about 8 to 10 hours. However, I believe the charger continues to charge in trickle mode, so you should remove the cells soon after they are charged. The Energizer CHDC8 will work well too, taking about half the time. Congratulations in your excellent articles. I read all of them and learned a lot. I still have a question. In this article you said “good” and “bad” fast chargers. Which ones are the good and which are the bad? Which use the voltage and which use the temperature control? The “bad” fast chargers are the ones that take an hour or less. The “good” ones generally take 2 to 5 hours. Most (if not) all of them use the voltage method, and many use the temperature as a backup. A video camera company called Tachyon says rechargeable batteries can damage the electronics because of the different voltage. They say to buy Energizer Lithium. Would that be correct to say they could damage the device, or do they just say that so they get fewer complaints about their cameras? Mark, if the company says that rechargeable batteries can damage the camera due to voltage, they are lying. NiMH rechargeable batteries start with a lower voltage than alkaline batteries (although alkalines will drop to the same voltage, whereas the NiMH voltage remains relatively flat, as shown in the graph). I suspect that they may be trying to avoid complaints, since regular NiMH batteries run down so quickly, even if the camera draws very little power. HOW MANY HOURS SHOULD I CHARGE IT IN THIS DUMB CHARGER…. PLEASE TELL MEEEEEE.??????????????????? Sami, an AC-DC adapter is not a dumb charger. In fact, it isn’t a charger at all. The current output rating of it is a maximum, not a specific amount that it will provide. Also, 12V isn’t enough to charge a 12V NiMH battery. I’d suggest obtaining the proper charger for your battery. Is there a solar powered charger that you you might recomend? Doug, I haven’t tried any of the solar powered chargers, so I’m afraid I don’t have any recommendations. So, is the NiMH battery a good choice for my digital cameras? Sounds like more even voltage, but maybe not much time on a charge. And, I do have a good source for alkaline AAs for a buck for a four-pk, so I’m not sure I see any advantage. Bill, I think you’ll find that any NiMH battery will outlast an alkaline in your digital camera. Alkalines just aren’t any good for high current applications, which digital cameras are (in short bursts). I suspect you’ll be spending more time changing batteries than taking pictures with your 4/$1 batteries. And 4 for $1 may seem cheap, but consider that good NiMHs will last for AT LEAST 500 cycles. So assuming your camera uses 4 batteries, those NiMH are good for about $500 worth of your 4/$1 alkalines. Not to mention, you’ll be avoiding throwing about 50lb of batteries into the garbage. Rafael, yes I agree that chargers, or at least how they’re described, should be more or less standardized. There are so many out there, some good, some bad, and some really bad, with no way for the non-guru to figure out which one is which. Very nice article. Makes me wonder in what line of buisiness your at? I am looking at using rechargeable batteries for in ear receivers and microfoon transmitters made by Sennheiser. The problem though is that 1.2 volts is probably to low as my gear does not work well with none of the rechargeables. Sennheiser sells their own battery packs. Very expensive ofcourse. I don’t know what the specs of these battery packs are. They might have more cells inside to get a higher voltage. Therefore I went to look at other possibility’s. One of them might be the zink battery’s. Only problem is that they start at 1.6 volts. I don’t now if my gear can handle that. Any suggestions? Noël, I’m in the software business. I tried the NiZn batteries (the manufacturer sent me some at my request), but after their charger destroyed 4 of them, I never heard from the company again, so I have serious doubts about their quality. If the gear is designed for 1.5V alkalines, then the 1.6V batteries are probably fine. Thank you very much for the superb, very high quality information you are offering to the people ! It is really very helpful ! Then, remembering the dog-fight between skeptics and believers on static magnets applied for magnetic de-scaling of calcite depositions in water tubes, I put batteries in a rather big ferrite (like the ones you may find in speaker’s) magnet, and I forgot them – not really believing there will be any result – until approaching December 2011. Then I remove them, and all – except two of them which I put again in the magnet with good results- there had been accepted for charging by the charger(s) and worked properly . I believe the results of this experiment – considering your technical skills ! – will enjoy a better future ! Baberjee, in your case, the maximum load isn’t limited by safety, but just by capacity. For most consumer AA NiMH batteries, the maximum safe load is around 1C (so 2100mA for a 2100mAh battery). But of course it will only deliver that much current for one hour before the battery is depleted. So if you want to run for two hours, you’re limited to about 1050mA. However, in the case of series-wired cells, you want to avoid the risk of discharging one cell before all the rest, since it will become reverse charged after that. Therefore, I’d suggest that you incorporate some sort of cut-off circuit which will disconnect the load when the voltage drops to about 1V per cell, and perhaps limit the current to about 800mA. I have a Ni-MH charger and had 4 eneloop AA in there. The charger turns off and thus must have some sensing electronics. At turn off, the charger and batteries feel quite warm. is it possible that temp turns off the charger BEFORE the full capacity is reached? then the cycles should get shorter until full capacity is reached. A normal person would do one cycle and employ the batteries. If one goes into remote places, the batteries are preferably maxed out. Can I test this? Werner, without knowing more about the particular charger, it’s hard to say for sure. A good smart-charger actually senses the voltage drop at the end of the charge cycle to determine that the cells are full. However, if you fully charge, then wait a while, and charge again, it takes a while for the voltage drop to appear again. Thus, the charger will charge for a while even on “fully charged” cells, but it should only be for a few minutes, not a full charge cycle. I would like to use Energizer (2450 mAh) NiMH batteries for my new keytar (Roland AX-SYNTH). Problem is: it needs 8 batteries to run… As you maybe know, the Energizer’s smart rechargers come with 4 slots at a time, i’ve seen some (low quality?) dumb 8-slot charger, but i would like to know what do you think ’bout them… Better to buy 2 x 4-slots-smart-chargers by Energizer, instead? …Should I really buy 16 batteries to swap them, just in case, (you know, rehearsals, busking, gigs, may take 4-6 hours even) or 1 set, sleeping-time-charging will be enough for a while? Thank you in advance for opinions and suggestions. Keep on! Hi Jool. Without knowing how much current your synth uses, it’s hard to say how many sets of batteries you’ll need. I don’t know if you need to two smart chargers or not. You could get away with one and just charge the 8 cells separately in two sets of 4. I’d stay away from the dumb chargers unless you’re very meticulous about running the batteries all the way down, and then recharging them only as long as needed. Stefan, you have convinced me to use low-self-discharge batteries instead of traditional NiMH batteries. However, at present I can’t get Eneloop batteries just the new Sony CycleEnergy batteries. So, are these Sony batteries a good alternative? By the way, if I can get Eneloop batteries I can charge them in a Sony BCG-34HRMD4 battery charger? Thanks in advance! Is it safe to use batteries from one brand with a charger from another brand? I have a GP charger and can’t find GP batteries since I moved. I found a local brand that matches the mAh requirements on my GP PowerBank but they specially say in the guidelines to use only GP batteries. Are they just up selling or is it really unsafe? Something I’ve noticed (and that some battery manufacturers & Battery University have confirmed) is that the so-called “memory effect” is GREATLY influenced by temperature (storage temp or usage temp). I think Stefan is saying that the memory effect is confused by many consumers with other effects – capacity loss or voltage depression. Basically, “freezing” NiMH batteries below 32˚F, or “cooking” NiMH batteries over ~100˚F is a bad idea if you value retaining their original charge capacity. [ Lithium batteries are more forgiving with regard to temperature. ] I see many battery-powered tools, flashlights, and lanterns on the market that use NiMH batteries. How do people expect them to retain a useful charge when those items are used/stored in extreme temperatures (e.g. Arizona in the summer, northern climes in the winter)? It’s also puzzling to me how battery health can be maintained with “dumb” chargers that aren’t microprocessor controlled and which measure/control current (charge rate), voltage, resistance, and at least the surface temperature of a battery. Unfortunately, the people using them in Arizona don’t have much choice about the temperature. It is what it is, but prolonged storage at 100˚F won’t damage the batteries. Also, storage at low temperatures won’t hurt them at all. They will have a lower capacity AT those temperatures, but once they have returned to more normal temperatures, they will bounce back. I used to fly my NiMH powered radio controlled planes at -10˚C (16˚F), and the first flight of the day usually started out rather anemic, but using the batteries warmed them up, and subsequent flights were the same as on a comfortable summer day. Charging with a dumb charger however (particularly, the overcharging that generally results), will damage the batteries, and will result in the voltage depression often mistaken for memory effect. thank you for the very well written article. After my “copper topped” battery leaked and destroyed my GPS, I have had to regroup. I bought a new device and high capacity NiMH batteries (Powerex 2700 and the green and black Duracell 2650). I also use 8 batteries in my LED flashlight. I bought the Powerex C9000 recharger/reconditioner. But, the instructions are hopelessly over-complicated. I thought I could put the batteries in and let the charger charge them, with the charger turning itself off after reaching a 100% charge. Is battery charging really so complicated? Now, I fear that I will do more harm than good leaving the batteries in the charger overnight. Question: When the charger says that my battery has reached 1.40+ volts – is the battery “done” – fully charged and to be removed and stored? Hi Stefan! I enjoyed reading your article. It was very informative. However, I do have a question. Hi Melissa. It really depends on how smart the charger is in the cradles. If it is smart enough to charge until full, and then maybe switch to a trickle charge, then it’s fine to leave them in the cradle. But if it continues to charge at a high rate (even as high as the low “overnight” rate), it will damage the batteries. The only data point I have to go on is that we have several cordless phones in our house, some AT&T, and one Panasonic, and after several years, we haven’t had any problems with leaving them in the cradle. The problem with NOT putting them in the cradle is that one is liable to forget to put them back every now and then for charging. Wow, that was an amazing read. Thank you. Don, it depends on the charger. If it has a sensitive enough charge-completion detection, it will work fine for NiMH. I have a 9V (9.6 Actually) 230 mAh that I am designing a circuit for. 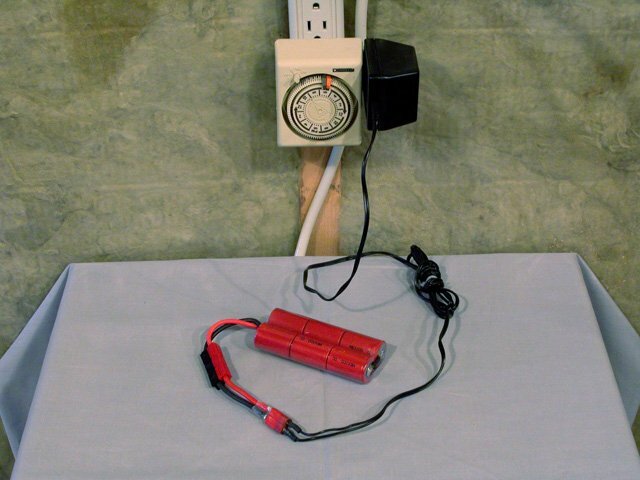 What is a safe voltage and current for me to use it for? I ment to ask what is a safe voltage and current to charge it with? Emil, if you’re charging with a dumb overnight charger, no more than 23mA. If you’re using a smart charger with a sensitive delta-V cut-off, you can probably get away with 100mA. Regarding the voltage, one doesn’t charge with voltage; one charges with current. The voltage will change as the battery charges. Your charger circuit is responsible for regulating the current to the desired limit. Ok so my 12V supply voltage is ok than. 12V might not be enough. If charging at 100mA or so, the 9.6V battery (which consists of eight 1.2V cells) might go all the way up to 12.8V (i.e. 1.6V/cell). To this you need to add whatever headroom your current regulator needs. Thanks for a very informative article. Wish I’d read it before investing in an Enercell recharger. I ended up using the 4 AA cells only once, then left them in the charger in the drawer for 4 months. When I plugged it in they wouldn’t charge. Then I read in the manual (and on your site) that you should never leave them in the charger. So have I irreversibly damaged these cells? Have they reversed polarity? I think the big lesson I’ve learned here is that if your battery needs are intermittent, you’re better off with regular, non-rechargeable batteries. Bob, a decent charger may be able to rejuvenate them, but they might be sub-standard cells to begin with, so maybe not. If your battery needs are intermittent, you’re best off with low self-discharge cells like Sanyo’s “Eneloop” line or Energizer’s pre-charged “Recharge” line. Both of these will retain about 80% charge after sitting in a drawer for a year (not in the charger of course). Thanks, Stefan, I will take your advice. Wonderfull articles about batteries. Let me ask please. My daughther has 2 toys that work with 3 AA batteries each (Duracell precharged 2000 MiAH), of course I have no control over the discharge rate. Can I fully discharge all 6 batteries in a penligth to later recharge again? I have not a 4 channel intelligent charger but a Digipower DPS3000+ wich charge only 4 or 2 batteries. Any aditional comment will be appreciated. Thank you. Vicente. Vincente, discharging them in a penlight to get them all to the same state of charge is a good idea, as long as it’s a penlight that uses a single AA. If you discharge two or more cells with different states of charge, the one that discharges first will become reverse charged while the remaining one(s) continue to discharge, which will permanently damage it. I am a frequent European traveler. About to leave on a 2+ week vacation. As usual I will be taking my excellent little Canon PowerShot SX100 IS point and shoot camera which delivers excellent pictures. Problem is that it “eats” AA batteries like mad. I am through battling this problem and am considering the rechargeable battery route. I know little about it. The Internet info is confusing. How many batteries should I take? What brand? What charger would work the best? I will be using European current, of course. Economy is not my major concern; having to constantly stop and change batteries is. Your help would be GREATLY appreciated and followed. Many thanks in advance. Richard, I’d highly recommend just about any of the brands of low self-discharge AA batteries like the Sanyo Eneloop, Powerex Imedion, or Energizer Recharge (made for Energizer by Sanyo). The latter are what I currently use in my Canon SX20IS (which uses 4xAA), and I typically shoot a few hundred pictures and about 1.5h of video between charges. Because these are low self-discharge, I also don’t need to worry about them running down when the camera is just sitting in the drawer. That charger will work on European current, but you’ll need an adapter to make the plug fit of course. For what it’s worth, I currently have a pair of Eneloops in my cordless shaver and a single Eneloop in my laptop mouse, and for a trip of one week or less, I leave the charger at home (I like to travel light). I use only rechargeable AA batteries in my Spin Brush toothbrush. Something that is very frustrating is that Synergy brand AA’s are slightly larger in diameter than the rest. Enough that they bind up in the battery compartment so it won’t run. Worthless to me. Thanks Synergy!! We plan to incorporate three 3rd generation eneloop NiMH recharageable batteries in series in our fingerprint door locks and use a monocrystalline solar cell (IXYS KXOB22-01X8, typical volage and cureent: (3.4V-Schottly diode drop of 0.3V) and 3.8mA) outside the door to “sub-trickle” charge the batteries. The residential locks see relatively low traffic (<50) accesses, each consumes around 200mA for 5 seconds. Nowhere in the literature covers the life of such an operation. Do you think it workable? Thank you for the information Stefan. I now realize that I have been seriously over-charging my batteries. I am not smart in topics such as the ones you are talking about, so I apologize if you have already answered the question that I am about to ask. I have a Kodak Digital Camera that is approximately six years old. I wondered if you could tell me which batteries and charger you would recommend for this type of device? My previous batteries would die after 3-4 pictures (some of this is due to my over-charging I believe). Great article – taught me more about batteries in a short time than I’ve learnt from 50 years of using rechargeables, starting with those old hammer flashguns with a huge battery pack pack in the 60’s. They gave you 40 full-power flashes….and you really learnt the hard way about the dreaded memory effect. I was really glad when NiMH came along. My problem now is that I have a digital radio which takes 6 C-size batteries. It chews up alkalines like a hungry lion. So I invested in 6 Energizer Hr14’s @2500mAh, despite reading that ‘size C NiMH rechargeable batteries will not work in DAB radios’ on several battery websites. They do work, but only last for about 3 hours (the alkalines died within 30 minutes). I have just found Memorex Pre-Charged C 4000mAh rechargeables on Amazon. Will these give me appreciably more time with my radio? It’s a big investment at nearly £24. Brian, it’s really hard to predict whether the higher capacity Memorex batteries will give you a long run time. In theory, yes, but if their internal resistance is higher, their effective voltage will be lower, and the radio might consider them “dead” sooner. However, I suspect you _will_ get longer run times. The 4000mAh capacity says to me that these are genuine C batteries, instead of AA wrapped in a C-sized shell. As such, the internal electrodes will be larger, and thus the internal resistance lower. It could be that the general consensus about C-sized NiMH not working in this radio is based on these wrapped AA type batteries. Stefan, I just bought a La Crosse BC-700U charger for my Energizer 2450 batteries. It has a few options for charging current (200, 500, 700 mA). I use the batteries in my wireless keyboard & mouse. What’s the best charge rate? All of the rates are low enough that they won’t harm the batteries. Even at 700mA, it’s going to take about 3.5 to 4 hours to charge (from completely flat). The lower currents are suitable for lower capacities (e.g. use 200mA for 800mAh AAAs). Hi Stefan, Very nice article. Very Informative. I’m planning to buy a multimeter to check from time to time how much load are left on my Eneloop AA NIHM batteries. I know from article above that voltage alone can’t determined this but do you think a voltage of 1v will give me an idea that it’s time to recharge? appreciate your thoughts. Thanks! Kristian, a voltage of 1V will only tell you that the batteries are dead, and have probably been dead for a week. However, a voltage of higher than 1V (for example, 1.25V) will NOT tell you that the batteries aren’t dead. Even a fully discharged NiMH with no load will read about 1.25V. So no, you can’t really tell anything from voltage alone. You need to put some sort of known load on them and measure the voltage under load. If you’re simply trying to determine when it’s best to charge stored but unused Eneloop batteries, it’s simple: just charge them once every 6 months and they’ll always be above 90% capacity. Thank you for the advise. More power. I am after a portable solar powered charging system for a 12V 1000 mah NiMH sealed battery for a metal detector. Its for a Minelab Eureka Gold. Any help or advice would be awesome. Great article. Have very quick query.. I have 2500mAh Ni-MH Rechargeable Batteries, can i use these for my house hold purpose, such as in TV remotes and wall clock? is it safe for using in those devices? Yes, you can use them. However, if they are not the low-self-discharge variety, you might find that they’re dead after a month or two. Hey, very thorough and accurate article. The section on the memory myth is close but slightly misses the truth, namely the degree of the myth. You are 100% correct that the memory effect was seen on satellites, and while the batteries did use the same chemical reaction as consumer NiCad cells, the construction was wildly different. The memory effect is specific to NiCad cells of that type, specifically sintered-plate NiCad cells, which are only used in aerospace applications. No consumer cell on the market is of this type. And the memory effect is not induced by charging or discharging to specific SoC’s (state of charges) over and over, or exactly the same length of charge alone. It’s induced by that AND performing no over charge. And it does need to be exactly the same – within 3% every time, with no over charge. After a few hundred cycles of that, sintered plate NiCads will exhibit the mythical memory effect. This does not happen in any consumer NiCad cells on the market. It is specific *only* to sintered plate NiCad batteries. Studies have been conducted to see if the memory effect can be reproduced in consumer cells. Under laboratory conditions, a variety of commercial NiCad cells were subjected to exactly the right conditions – the same as the satellite batteries – and they finally simply gave up, as after 700 cycles of this ‘abuse’, the memory effect failed to be reproduced in any way in any cell. There is no such thing as the memory effect for any NiCad battery operating on Earth. Perhaps in space :). Er, I was speaking on the paragraph about ‘true memory effect’. Voltage depression is of course very real, if one wants to call that memory. I think, as you say, voltage depression is more accurate :). Fantastic resource regardless. Thanks for writing this. I have 15 cell 1500 mah nimh battery of 10c/15c burst. I want to use this for electric flight.I am experiencing a huge voltage drop under load….from 19.5V to 12 V for just 6A current drawn. What am I missing here? Voltage returns back to normal as soon as the load is off. The cells probably have a very high internal resistance (on the order of 1 Ohm each). Either that, or you have poor electrical connections between the cells, and are losing voltage there. I’ve got one of the Duracell CEF15NC chargers, and I have the “Blinking Light” problem with batteries that charge just fine elsewhere. I’ve done some experimentation with this and determined that multiple retries with the batteries will get the thing started charging. That says to me that the charger is falsely detecting excessive charging current on drained batteries which, once they get enough charge in them to raise the internal voltage some, no longer trigger the excess current detection. So… I took the charger apart, thinking I’d modify the circuit and change its attitude enough to make it work (I’m a EE) – and lo and behold, there are 4 calibration pots inside it. It’s a complicated device – several circuit boards and what is probably a programmable controller and maybe another custom IC, and I’ll bet that a couple of adjustments in those pots will make it quit whining about perfectly good batteries. So now, I want a service manual with the calibration procedure… I’m sure that’s the last thing Duracell or whatever Chinese, Iranian, or Martian company they have making it for them *wants* me to have, but that’s tough. (Yeah, I know, good luck… but this is the only site I’ve found where it looked like maybe it was worth asking…). I’d love to help you, but I don’t have any information on this product. Thanks… This isn’t the first time I’ve wanted a service manual or schematic to fix some modern electronic device, and can’t find one. I was just hoping maybe somebody on here knows how to get such things (service manuals, schematics, etc.). The frustrating thing is that the information *has* to exist, in order for the manufacturers to even produce the devices, but yet we *mere* consumers out here can’t have access to it no matter what. That’s more and more the case with the “throwaway” electronic stuff – BITD you used to be able to get complete schematics and troubleshooting information easily, even before the Internet existed. What’s really amazing is that if you call the manufacturers and ask them for the information they’ll get all huffy and tell you it’s “proprietary”, and then they’ll try to *sell* you a *replacement* product, as though you’re so stupid you’ll buy ANOTHER piece of junk from them! (When all else fails I like to respond with “well, I guess I’ll just have to trace the schematic myself and post it on the Internet”, just to see them go ballistic… fun, but not much help). (This device is too complex to deal with that way, in any case…). I know exactly where you’re coming from. I remember when I was a kid, and the TV would break, my Dad would get the schematics, troubleshoot it, and fix it. Same thing with service manuals for cars. Given that there are a number of adjustment pots, perhaps the device isn’t as complicated as it seems. Are you sure one of the chips is a microcontroller? Your discharge curve chart … did you just draw that, or did you actually measure it? And if you did measure it … for what batteries and what discharge rate? I ask because … 1) NiMH cells start at 1.41 volts, not 1.2 volts like you say, and 2) the discharge curve isn’t quite as flat as you drew. Also, you seem to have the NiMH voltage *increasing* slightly during the discharge, which really doesn’t happen in the real world. Do a google image search for “nimh discharge curve” to see a bunch of real world discharge curves for what it *should* look like. The discharge curves are from actual batteries, measured under load, using BattMan II. I don’t recall the batteries and discharge rates used for that particular graph, but it was likely a Sanyo Eneloop, discharged at either a C/2 or C/5 rate. A fully charged NiMH cell is indeed around 1.4V, but it very quickly drops to around 1.2V when a load is placed on it. So quickly, that the first pixel of the graph would be a vertical line. And yes, the discharge curve is that flat under a reasonable load. The slight rise is also not uncommon. If the battery has been sitting for a while, the electrolyte can settle out slightly. Once it starts discharging, especially at high rates, things even out as it warms up. The internal resistance decreases, and the output voltage increases. I prefer to display discharge curves the way they *actually* look, not the way they *should* look. Here are some that pop up when Googling: Testing Sanyo’s Eneloop Low Self-Discharge Rechargeable Battery. http://www.stefanv.com/electronics/eneloop/discharge0.gif shows your pack petering out at 1367 mAh. Of course there’s a little capacity left, but not much more. http://www.stefanv.com/electronics/eneloop/discharge0.gif shows your pack petering out at around 70 / 60 * 1200 or 1400 mAh. The graph you chose was of the Eneloops right of of the package (i.e. with their 70% factory charge). You’ll notice that in later graphs, the Eneloops are giving very close to 2000mAh, even at 1.2A. It’s likely that I tested Energizer low self-discharge batteries, which were selected rebadged Eneloops, typically delivering around 2400-2500mAh at 400mA. I will not redo the graph. It is conceptually correct, and illustrates the point I’m trying to make. Sorry, I did indeed miss that the first graph did not have the battery being charged before testing. The later graphs shows more what I’m used to … about 2000 mAh. Even so, t-nimh_vs_alkaline.gif’s NiMH discharge curve doesn’t match your Eneloop testing page graphs — the beginning 1.4 volt part should show up (it should be more than a single pixel) unless the discharge rate was significantly higher than 1.2 amps, the measured capacity (>2200 mAh) seems too high unless the battery wasn’t a LSD battery available in 2008, etc. The part with the voltage increasing (a tiny amount) is certainly odd — I haven’t seen that in anybody else’s testing or my own — but it’s clearly there and pretty small, and things warming up certainly could explain it. And the alkaline discharge curve part clearly doesn’t have the battery being discharged at over an amp like the NiMH cell — 0.1 amps seems more likely. http://www.powerstream.com/AA-tests.htm has a pretty good list of discharge curves for various alkalines and their NiMH cells, as of 2006 anyways. But if you’re happy with the graph, then so be it. Somebody used your “A NiMH battery starts out at about 1.2V, but as it discharges, the voltage remains relatively constant …” statement and that graph to attempt to correct me when I pointed out that NiMH cells start at 1.4 volts, not 1.22 volts like he had declared. Ah, I see. But for all intents and purposes, it does start out at 1.2V, since the 1.4V doesn’t last long enough to do anything useful with it. I’ll add a parenthetical comment to that effect. At a C/20 (around 100 mA) discharge rate (the sort of rate that alkalines do well at) a fully charged NiMH Eneloop AA won’t actually hit 1.20 volts until it’s around 70% discharged. At 100 mA, it’ll even stay above 1.3 volts for around 20% of its life, where a good alkaline would stay above 1.3 volts around 30% of its life. It’s all about the discharge rate. Subject most alkaline AA’s to a 1.2 amp discharge rate, and they’ll be down to 1.2 volts within about 15% of their rated capacity, and will be dead at around 50% of their rated capacity. Using your http://www.stefanv.com/electronics/eneloop/cycle5.gif test, the cells don’t hit 1.2 volts until about they’re about 20% gone — and this is at a relatively large discharge rate — given that this was 2007, they’re probably 2000 mAh Eneloops, so over C/2. At a C/20 discharge rate, the battery will be around 70% gone before it finally hits 1.20 volts. i wonder if you know where it is possible to get a battery package made. as I have a battery pack that is voltage rated 36vots, and13 Amp Hours. it is for a bicycle. There are 5 tubes of battery 36cms long and 2 45cms long. 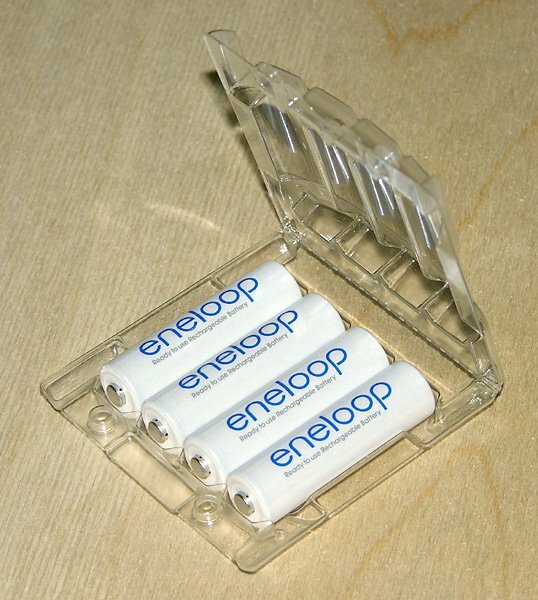 A couple of months ago I bought a package of Eneloop NiMH batteries that came with the Eneloop charger. I bought them because of the long shelf life/low self discharge claim coupled with high discharge capability. My primary application was electronic flash photography. Make a long story short I charged them all up as soon as I bought them even though they are said to be precharged at the factory. Then I put a set in one of my electronic flash units that I intended to use shortly on a trip. Turns out I never did use that flash on the trip, so other than a couple of test flashes to make sure everything works I didn’t actually need the flash until a couple of weeks after returning from the trip. Much to my chagrin in front of the customer the flash would not fire even though the LCD display on the back does light up. When I got home I checked the voltage on each of the four AA cells and they were all in the 1.02 volt range. They had been 1.20 volts after I first charged them a couple of months before needing them. So what happened? For comparison sake I tested three other batteries from the same batch that had never been used since I charged them. They ALL read 1.34 volts. That electronic flash gun must have some internal trickle leakage that is present even when the unit is shut off. From now on I’ll keep the batteries removed from that flash until I need to use it. The Eneloop charger warns to not store the batteries in the charger unless you are actually charging. In fact the charger came with a piece of cardboard inserted to prevent just that situation on the store shelf. Yes, a lot of devices these days draw a small amount of current even when “off”, which will run down any battery, regardless of whether or not it’s low self-discharge. I have an emergency flashlight that I can’t keep the batteries in, because it has a tiny blinking LED to help you find it in the dark. That LED runs down the batteries over the course of six months or so. @Dave – I’m amazed, I encountered the exact same issue with the exact same charger. Keep trying enough times and the batteries will take enough charge to “bootstrap” the charging cycle. And, I didn’t even bother calling the mfr. for a schematic or service manual; I’ve gotten the *exact* same treatment you’re describing from the arrogant nitwits in Customer Non-support at those places – and just as you say, it’s frustrating because you *know* there’s an exact calibration procedure for it somewhere. And, yes, I’m a EE as well, AND considered tracing the schematic, but it looked like quite a task, with the multiple circuit boards (dual layer IIRC), interconnect, etc. NTL… I haven’t forgotten about it and one thing that did occur to me was that it should be possible to hook a programmable supply up in place of the batteries and do a force current/measure voltage and vice-versa analysis of the DC characteristics, first capturing the values at the original pot settings and then changing them one at a time to determine their effect. Stefan, followed the link from Michael’s website to yours. Oddly any new alkaline batteries used in my Fuji Finepix S4430 camera would last about 12 photos, then blink a red dead battery on the screen and shut-off. I was totally upset about the camera being “battery” hungry. After reading others who used rechargeables with the camera (manufacture says not to), the Rayovac NiMH would in turn last a few hours. Not once have any of the rechargeable batteries ever got warm. Even the no-name solar light brands charge well with it. It states to be a fast charger, but 4-hrs/8-hrs is not very fast. Thus, I had purchased more batteries to swap as I need them. Keep this battery article on the web. It serves well to the millions who have viewed it. Even in 2016! I just wanted to say thank you for the article; I found it informative and useful. I like your style of writing and method of presenting the information. If it were me, I’d just use a discarded 5V power adapter and a 27 Ohm 1 Watt resistor to limit the charge current to 130mA (the C/10 rate for a 1300mAh cell), and slow charge it for 15 hours. I read somewhere that it’s important to charge them with the right amount of time, but I can’t find anywhere that specifies this. I wait to hear from you, thank you in advance. Based on the capacity of the battery (2000mAh), the charging rate of that charger (130mA), and typical charging efficiency, I would recommend 18-19 hours for fully discharged batteries. However, I would not use a “dumb charger” like this for NiMH batteries, as they don’t tolerate overcharge very well, and overcharge is difficult to avoid if you don’t know how discharged the batteries are. A so-called “smart charger” monitors the state of each cell (preferably individually) during charging, and stops charging when they are fully charged. What is the ADVERTISED voltage of these batteries? A single cell AA should be around 1.5V when fully charged, right? I am considering an alternative 18650 or 26650 battery. The advertised voltage is 1.2V. Fully charged is about 1.3V, and almost dead is about 1.1V. I’m attempting to use a NiHM battery in a product that would require some force and impact (like a tennis ball). Have you any data that suggests how these particular batteries work and are constructed? Have you any idea what kind of life expectancy I could hope for? How much protection would you image might be necessary? Any other data or information would be gratefully received.